The peaceful swirls and knots that decorate Celtic wedding rings often resonate deeply with the people who wear and see them. This is probably because Celtic culture and traditions are so deeply rooted in reverence for the earth, community and family that the messages of flowing and connecting are obvious in every part of the artwork. The designs themselves create a sense of belonging and commitment. 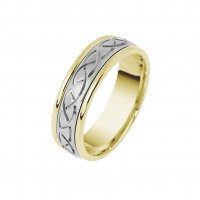 This selection of wedding bands is designed for couples that want to seal their lifelong commitment with a Celtic knot. 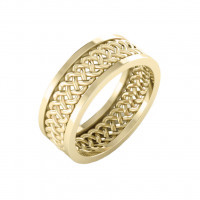 Each ring is designed for comfort and beauty, featuring two-toned details and a deeply carved Celtic knot pattern. As with all of the rings available from Timeless Wedding Bands, our Celtic rings can be customized for width and engraved with a special message of love.